Although custom vans are just a bad memory in America, they are still hugely popular in Japan. 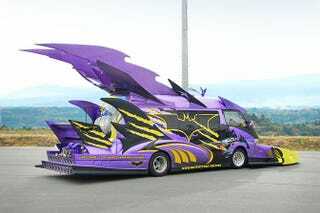 The Batvan is the result of one van owner's decision to mix a serious love of Batman with Japan's extreme custom van culture. Japan has a knack for taking American ideas and putting a unique spin on them. Although the custom van craze of the 70s may have originated in America, it is clear when you lay eyes on the Batvan that Japan has made custom van culture their own. Looking at the Batvan is overwhelming to the senses. The huge fiberglass wings and body kit mixed with the Batman theme produces something that looks more like animation then the real world. You have to wonder if the top wings or front overhang are removable for highway travel. The level of detail on the Batvan is pretty amazing. Whoever painted the murals must have spent many long nights locked up in a bat cave to complete it. The Batvan even travels with a scale replica of itself and a life-size Batman statue. Well, why wouldn't it?